(May 21, 2015) – Mobile Stem Care LLC, a company aimed at helping veterinarians treat their patients with the latest stem cell therapies, is the newest start-up to take up residence at the UTSA New Venture Incubator. It joins several other companies that have been in the incubator such as Rochal Industries, Viroxis and Cardiovate. As a member of the incubator, Mobile Stem Care’s biomedical engineers will leverage the business knowledge of the incubators’ members and dedicated laboratories to conduct pilot studies for its unique brand of mobile veterinary services and products. With the incubator’s resources at their disposal, Mobile Stem Care’s will better serve its burgeoning clientele with cutting edge veterinary care services. 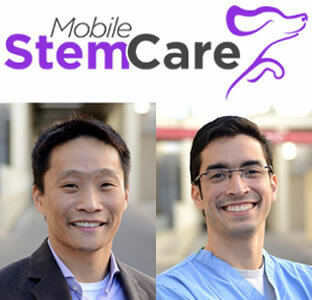 Doctoral students Ramon Coronado and Tony Yuan in the UTSA College of Engineering’s Department of Biomedical Engineering founded Mobile Stem Care in 2013 after completing the graduate certificate program in Technology Entrepreneurship and Management offered through the UTSA College of Business. The first of its kind in the country, Mobile Stem Care offers mobile adipose stem cell and platelet rich plasma (PRP) isolation to veterinarians for treatments in dogs, cats and other animals suffering from degenerative diseases such as osteoarthritis or hip dysplasia, ligament and tendon injuries, and non-healing wounds. The company isolates adipose tissue (fat) collected from the affected animal by the veterinary doctor and its adult stem cells on-site in less than 90 minutes. Since its launch, Mobile Stem Care has developed partnerships with local and out-of-state veterinary clinics, veterinary hospitals and zoos. In mid-April, the company trumped seven other start-ups at the 2015 Emerging Medical Technology Symposium (EMTS) in the annual EMTS pitch competition. Since 2010, the NVI has served as a bridge between San Antonio entrepreneurs and the region’s research and development community. Managed by the UTSA Office of Commercialization and Innovation, it connects world-class research with business partners that will advance the innovations to commercialization. The UTSA NVI program supports companies licensing and commercializing UTSA intellectual property, companies collaborating with UTSA researchers on sponsored research programs, and new UTSA student and faculty start-up companies entering the San Antonio technology-based business ecosystem. For more information about the New Venture Incubator or to learn about opportunities for collaboration, visit research.utsa.edu/commercialization/nvi.php.